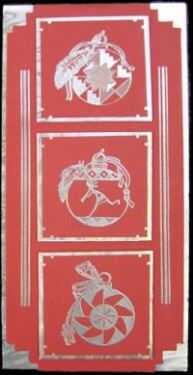 Stamp and emboss all three Ornaments on red card stock with silver ink and emboss with silver powder. Cut corners with Southwest Punch. Layer all three on silver card stock what has been cut slightly larger. Attach to red panel with foam dots. On red panel, stamp and emboss Lines stamp with silver ink and emboss with silver powder. Attach to silver card stock. Corners were cut with Aztec Scissors. Note: This is an over-sized card and fits into a business envelope. There are a few variations that will fit into a standard envelope. Be creative! 2131F SW Ornament #1, sm. 2133F SW Ornament #2, sm.